Rivers of fog draped across the mountain sides like an undulating snake, or a scarf tossed carelessly over a shoulder. Perhaps now that the Drycreek drainage is showing off the new shape that was hidden under the tall evergreens, she’s heading out to a winter party to show off. Sighing deeply at the loss of the luxuriant evergreen giants, The smile returns as I contemplate the new growth already manifesting on the hillside. Elk, Bear, and Deer will love this change that will bring in more low growing forage of leaf and berries. I recall the bear from a couple summers ago that was feasting on wild blackberries or currents out in the older clear-cut that has been growing back. Change is part of a forest, both natural and manmade, and often brings about a healthier ecosystem. Not always, of course, at least not in the short term. However looking at the long-term picture of which we are just a very small part, the world has been changing throughout its history and we live such a short amount of time we tend to think it’s always been this way. Have we affected these changes? Certainly we have, and not always for the best, but change will still happen without us at its own pace. We just seem to rush it along. Clicking the link opens a new tab or window. Meanwhile near Glenwood lovely fall leaves of Vine Maple, Dogwood, Elderberry, and Cottonwood reflected beautifully in a small stream. Back in mid October, Outlet Falls was starting to increase the water flow. I am sure by now there is a great deal more water. I finally spotted my first elk herd of the season on Conboy National Wildlife Refuge recently… was not able to get good quality pics but sharing anyway. The real treat was watching them come out of the field, up and over a fence and across the road, flowing like a river of brown. They are so big, yet so graceful. Here we have a series of Mount Adams from Glenwood, taken about 2 weeks apart. This first one is October 1, 2017. Next is sunrise October 14. Notice the snow around and below treeline? That whole area is a burn scar, hit first by the Cold Springs fire in 2008 and more recently hit hard by the Cougar Creek Fire in 2015. A bit further west, the burn scar continues its way along the south and west sides of the mountain from the Cascade Creek Fire of 2012. 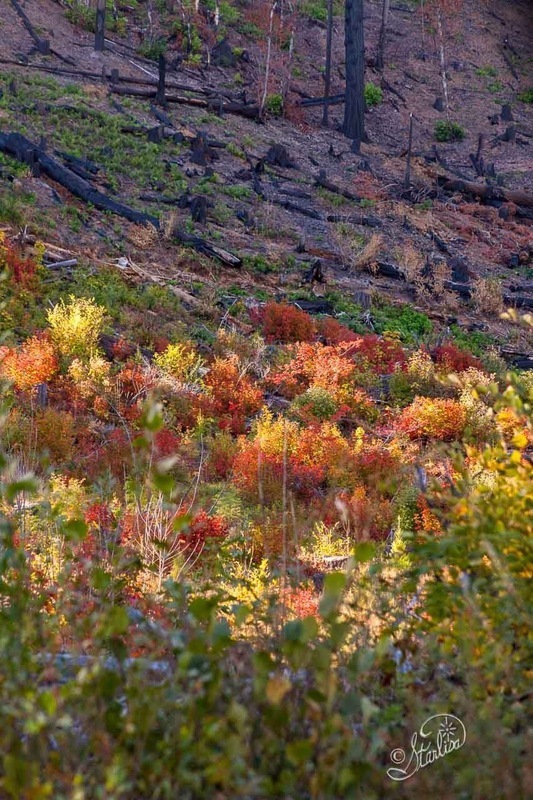 There have been other fires before those 3 as well, and the Huckleberry bushes love coming back in burns. Wildflower meadows thrive as well, and the Elk and Deer have more grazing areas. and rainbow from November 1, 2017. 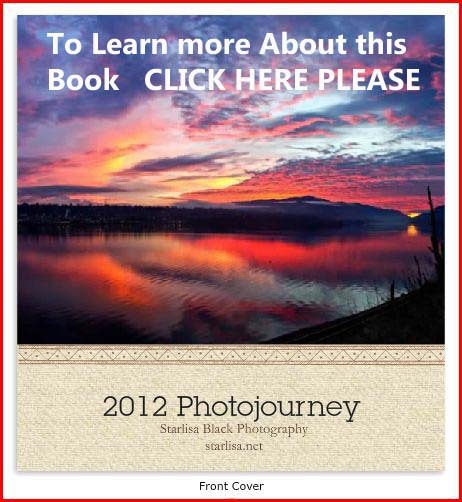 I would love to hear from you.. which were your favorite photos, perhaps, or what fall means to you! 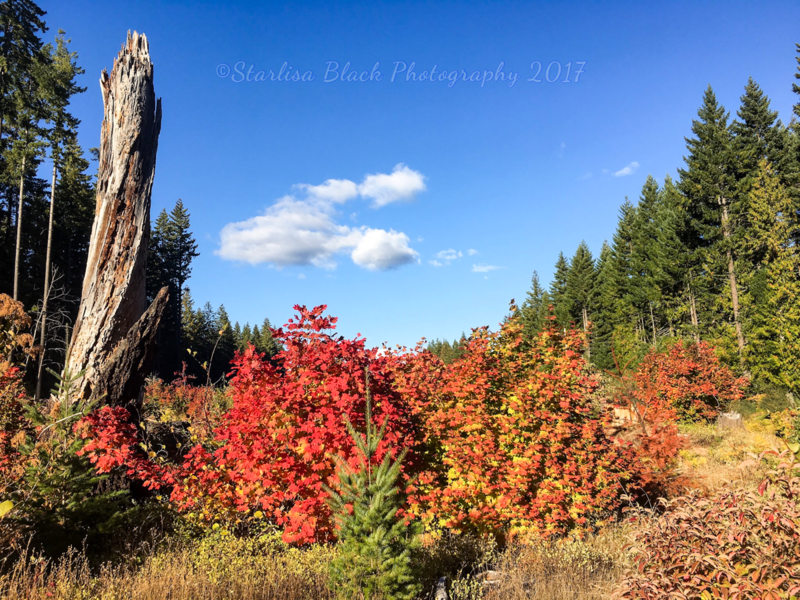 This entry was posted in Atmospheric Optics, fall colors, Mount Adams, National parks and refuges, Photography and tagged animals, Elk, Fall, Fall Colors, Glenwood, lenticular clouds, lenticularis, Mount Adams, Mt. Adams, Mt. 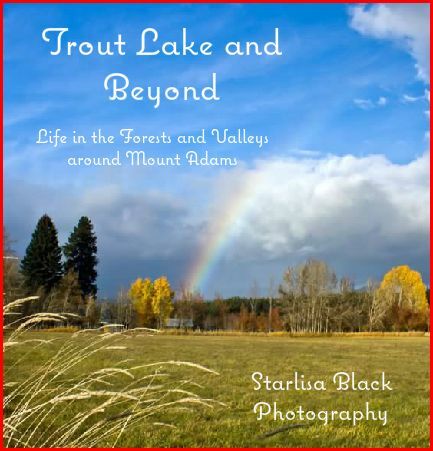 Adams Territory, Nature, rainbow, Trout Lake, volcano, Washington, Washington State, weather. If you enjoy the work I share, consider helping with a tank of gas or other expenses, so that I may continue sharing my bit of paradise with you. My old truck is not going to last much longer! I started with nothing, and no money to do promotion, but you have all helped me in one way or another get to this point and I thank you all. My current primary job is part time caregiving of sister. Contact me at starlisa.black@gmail.com about availability and purchase of different images you see,and like. Consider dropping something in to my Tip Jar so that I can keep sharing photos, Let me know if I can thank you publicly with a post., or include an email or PO address so I can thank you that way. Starlisa Black Photography on Facebook… come “LIKE” me there!